The video was produced by the Florida Academy of Collaborative Professionals. This story is not unique to this family. Because the attorneys in a collaborative case are forbidden from appearing in nasty court hearings, collaborative divorce attorneys are incentivized to discourage conflict and promote cooperation. Further, a neutral facilitator with a background in psychology or social work helps tend to the emotional needs of clients. And because a neutral financial professional is working with both spouses, he or she can help develop financial options that meet the needs of both. 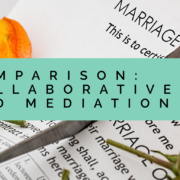 If you are considering divorce, look into the collaborative process. And if you are already in the throes of a divorce battle, it is not too late. You, too, should seek a second opinion from a collaboratively-trained attorney to see how you can change the dynamics. Adam B. Cordover is a collaborative attorney, American Bar Association author, and collaborative trainer in Tampa Bay. He is also on the Board of Directors of the Florida Academy of Collaborative Professionals, an incoming Board Member of the International Academy of Collaborative Professionals, and a former president of Next Generation Divorce (a collaborative practice group made up of attorneys, mental health professionals, financial professionals, and mediators). He practices in Hillsborough, Pinellas, Pasco, Manatee, and Sarasota counties and throughout the state of Florida.